برینیولی, ژان-دومینیک. (1394). اقامتگاه شاهی «عباس آباد»، «گوشۀ عیش» شاه‌ عباس اول در مازندران. مجله علمی-ترویجی منظر, 7(33), 40-47. ژان-دومینیک برینیولی. "اقامتگاه شاهی «عباس آباد»، «گوشۀ عیش» شاه‌ عباس اول در مازندران". مجله علمی-ترویجی منظر, 7, 33, 1394, 40-47. برینیولی, ژان-دومینیک. (1394). 'اقامتگاه شاهی «عباس آباد»، «گوشۀ عیش» شاه‌ عباس اول در مازندران', مجله علمی-ترویجی منظر, 7(33), pp. 40-47. برینیولی, ژان-دومینیک. اقامتگاه شاهی «عباس آباد»، «گوشۀ عیش» شاه‌ عباس اول در مازندران. 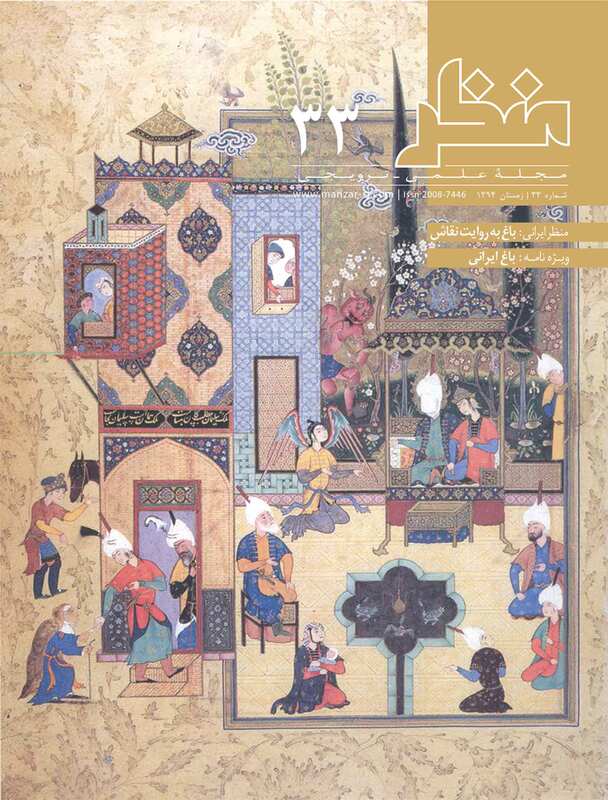 مجله علمی-ترویجی منظر, 1394; 7(33): 40-47. در میان کاخ‌های شاه‌عباس اول در مازندران، عمارت عباس‌آباد به جهت ویژگی‌های بارزی که دارد، قابل‌توجه است. این عمارت را می‌توان محل تلاقی باغسازی غیررسمی و باغسازی رسمی دانست؛ چنانکه در آن یک دریاچۀ مصنوعی که عناصر باغسازی آزادانه اطرافش شکل‌گرفته‌اند و فضایی کاملاً هندسی که با ارتفاع از سطح دریاچه قرارگرفته، به هم متصل می‌شوند. همزیستی این دو بخش و ارتباط نزدیک این اقامتگاه با طبیعت جنگلی اطراف، نمایانگر نوعی ارتباط اصیل میان برخی از باغ‌های صفوی با منظر طبیعی است؛ رابطه‌ای که به‌صورت تمایل برای «حفظ» یا «بازتولید» طبیعت با ویژگی‌های بکر و رام نشدۀ آن بروز می‌کند. ازاین‌روی در عباس‌آباد بهشهر به‌جای یک کاخ سلطنتی باشکوه، اقامتگاه شکاری ساده‌ای ساخته می‌شود که گوشة عیش شاه‌عباس اول است. Among Shâh ‘Abbâs I’s palaces in Mâzanderân, the ‘Abbâsâbâd estate is outstanding by its original features: it linked an informal garden, the elements of which are loosely assembled around an artificial lake to a formal space, on higher grounds, with a geometrical outlay, more common in the art of Persian gardens. The coexistence of these juxtaposed parts and the close relation of the residence with the surrounding forest, the lack of outside walls customary in Persian gardens, hint at an original relation of some Safavid gardens with the natural landscape i.e. a will to “reproduce” or “preserve” nature in its wilder aspects, with the intent, not of building a great Royal garden, but rather, a simple hunting residence: a gusheh-ye ‘eysh-e shâh, a "pleasure corner for the king". جلال‌الدین منجم یزدی. (1366). تاریخ عباسی. به ک.شش سیف‌الله وحیدنیا. تهران انتشارات وحید. Alemi, M. (1994). I giardini reali di Ashraf e Farahâbâd. In Il giardini islamico, Architettura, natura, paesaggio. Edited by Petruccioli, A. Milan: Mondadori Electa. Alemi, M. (2007). Princely Safavid Gardens: Stage for Rituals of Imperial Display and Political legitimacy. In Middle East Garden Traditions: Unity and Diversity. Edited by Conan, M. Washington D.C.: Dumbarton Oaks Research Library and Collection. Brignoli, J.D. (2007). The Royal Gardens of Farahâbâd and the Fall of Shâh Soltân Hoseyn Revisited. In Middle East Garden Traditions: Unity and Diversity. Edited by Conan, M. Washington D.C.: Dumbarton Oaks Research Library and Collection. Brignoli, J.D. (2009). Les palais royaux safavides (1501-1722) : architecture et pouvoir. Unpublished doctoral dissertation. Aix-en-Provence: Université Aix-Marseille I.
Della Valle, P. (1684). Les fameux voyages de Pietro Della Valle, gentilhomme romain, surnommé l'illustre voyageur, avec un dénombrement très exact des choses les plus curieuses, et les plus remarquables qu'il a vécues dans la Turquie, l'Egypte, la Palestine, la Perse, et les Indes Orientales, et que les auteurs qui en ont ci-devant écrit, n'ont jamais observées. Vol. 2. Paris: Chez la veuve Gervais Chusier. Herbert, T. (1663). Relation du voyage de Perse et des Indes orientales. Translated from English by De Wicquefort, A. Paris: Chez Jean Du Puis. Porter, Y. (1996). Les Jardins d’Ashraf Vus Par Henry Viollet. In Res Orientales VIII: Sites et Monuments Disparus D’après Les Témoignages de Voyageurs. Edited by Gyselen, R. Bures-sur-Yvette: Peeters Press. WHC (World Heritage Convention). (2011). The Persian Garden. Registration Form for UNESCO’s World Heritage List.